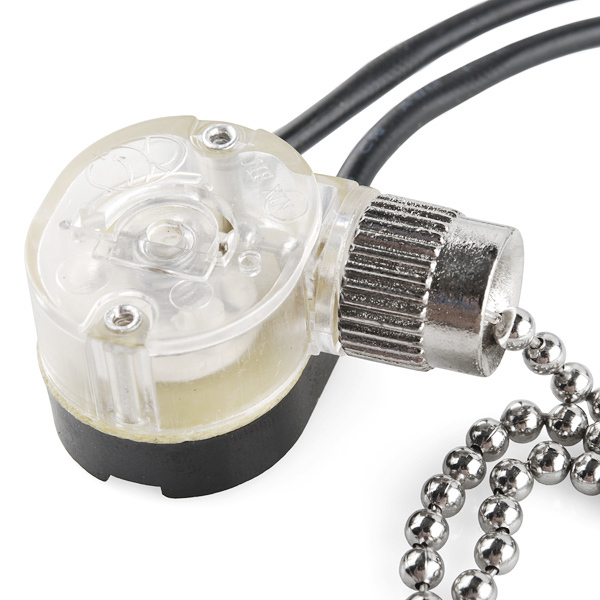 This may seem like an odd one for us, but pull-chain switches are actually pretty handy! This is similar to the kind of pull-chain you'd find on lights and ceiling fans. It's a simple SPST on-off switch (pull once for on, pull again for off). 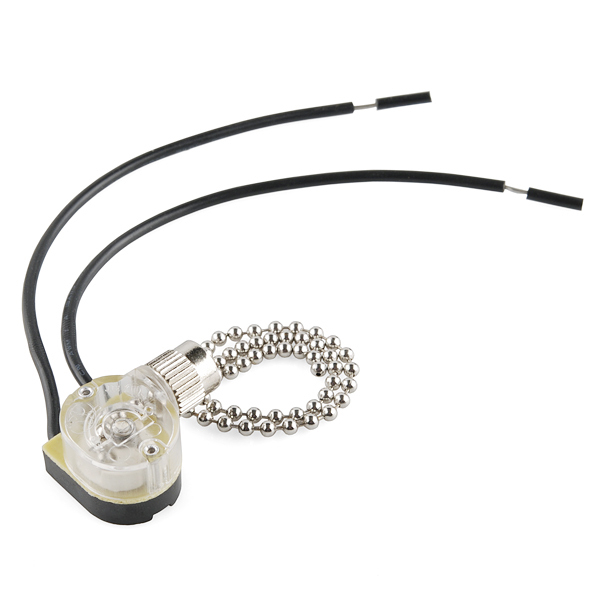 This switch has 6" wire leads and a 10" pull-chain. 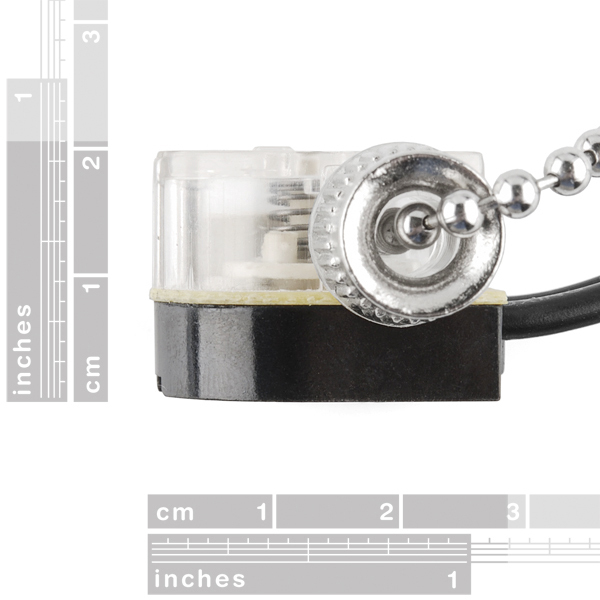 The switch can be panel mounted in a 3/8" diameter hole. I ride the train almost everyday and there are some very unsavory characters sometimes. I've had my backpack opened and my phone charger stolen while I was riding on the train one morning and I've discovered my pockets opened several times (assuming a failed attempt). This particular day it was very crowded and I remember the person bumping into me several times. I thought nothing of it at the time since it was so crowded and he seemed to be hitting me when the train slowed down (which made sense). So I've been trying to figure out an idea to give me an audible alert when my backback is unzipped. I think this is the key - I can attach the pull chain to one zipper head and affix the other side to the inside of the backpack. If someone tries to open the chain without pressing the disable button it will fire a relay which will turn on a piezo buzzer letting everyone withing 50 ft know that my backpack was tampered with! That is a very, very good idea instead of a piezo buzzer use the car air horn things that sparkfun sells that would be hilarious. ya it would scare the crap out of you... now that i think about it, you would need some power for that but hey you could always try . AWESOME! I know I could have always bought this at the local home center store, but only when I saw it on sparkfun did I have the vision of an electronic pinata! I can see it now - Each kid pulls the cord once, and if a random number hits a certain value, a magnetic lock turns off, which was holding a flap closed, thereby letting all the candy out! where is the fun in that... like really it is a good idea but the kids are all like ohh your that kind of guy who likes to take the fun out of everything. The fun in pinata is the fact that you get to whack the crap out of something. Take that into consideration. But back to the idea... that would be kinda cool to see. BTW i do realize that i am replying to this 8 months after the fact. of course.. still kidding! :-) Just any excuse to buy something from Sparkfun, right?! ?